The Sonderkommando or ("Special Command Units') were Jewish prisoners who were forced to work in the death camps at the grisly task of burning of the corpses of those already murdered by the Nazi's. For periods lasting from two to four month's these units worked under hellish conditions until they themselves were liquidated by the Germans, and the first task of their replacements was to dispose of the bodies of the previous group. Since a Sonderkommando usually comprised men from incoming transports, their second task often consisted of disposing of the bodies of their own families. At Birkenau their duties included guiding the new arrivals into the gas chambers, removing the bodies afterwards, shaving hair, removing teeth, sorting through possessions, cremating the bodies, in the crematoria or open air pits and disposing of the ashes. At the end of June 1944 the Sonderkommando was moved from Barracks No 13 in Section BII d, to live in the attacks of Crematoria Nos II, III and IV. Among the prisoners were nineteen Soviet Prisoners of War from Majdanek who incited members of the Sonderkommando to revolt. A group of leaders was formed consisting of Jozef Deresinski, Zalman Gradowski, Jankiel Handelsman, Ajzyk Kalniak, Lajb Langfus, Zalman Lewental, Lajb Panusz and Jozef Warszawski, whose real name was Jozef Dorebus. The Sonderkommando resistance leaders made contact with some Jewish girls who worked in the munitions factory Weichsel – Union Metallwerke, which was located near the Auschwitz main camp. Salmen Lewental one of the Sonderkommando leaders kept a written record in a small notebook which was buried in a jar under the earth, which was found after the war. Two other leaders of the Sonderkommando Israel Gutman and Jehuda Lerner began to receive small quantities of explosives from the girls employed in the munitions factory, hidden in a false bottom of a food tray. “When I was standing near my friend he told me there was a search going on. He told me that he had not time to put the explosives in the saucers and that the explosives were on his body in a cigarette package. 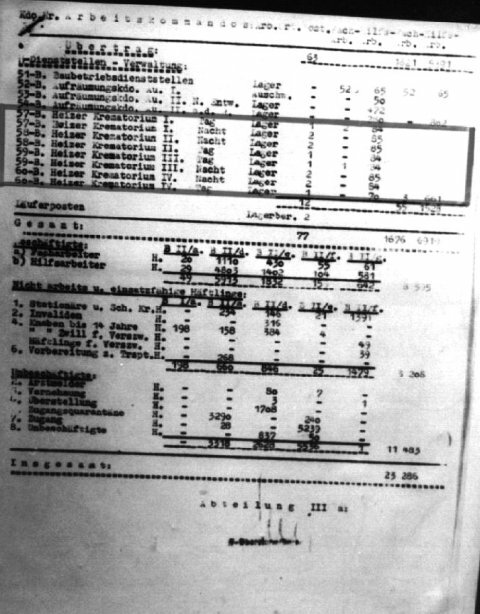 SS listing from October 7, 1944 detailing current strength of Jewish Sonderkommando referred to as "stokers"
I knew quite well that not only we would be killed as retaliation, but all the underground of Auschwitz was jeopardised. When they carried out the search they felt that I was trembling and they then searched me very thoroughly. On the 7 October 1944 the camp underground military leaders sent an urgent warning to the resistance cadre at the crematoria that they had learned the SS were going to liquidate the Sonderkommando shortly. On that fateful morning the Senior Sonderkommando man at Crematorium IV was ordered to draw up lists for evacuation of three hundred men on the same day, out of the total complement of eight hundred and seventy –four men. “Towards mid-day Scharfuhrer Busch, Unterscharfuhrer Gorges and several other SS men and guards arrived in the yard in front of crematorium IV. All prisoners were ordered to line up, with the exception of fourteen who were away on their various jobs and who, in any case, were not affected by the selection. Then Chaim Neuhof, a Jew from Sosnowice, who had been a member of the Sonderkommando since 1942, approached SS Staff Sergeant Busch and after a brief exchange, yelled the password “Hurrah” and struck the SS man with a hammer. "They showed an immense courage refusing to budge from the spot. They set up a loud shout, hurled themselves upon the guards with hammers and axes, wounded some of them, the rest they beat with what they could get at, they pelted them with stones without further ado. Members of the Sonderkommando at Crematorium IV attacked the SS and several SS men were wounded, whilst other SS sought cover behind the barbed-wire fence, shooting at the prisoners with their machine pistols. The men in Kommando 59-B using the explosives in hand -made grenades blew up the crematorium, which burst into flames. After cutting the barbed-wire fence, the prisoners got away into the nearby wood. At the sound of explosions and fighting the members of Kommando 57-B at Crematorium Number II started to revolt. The Reichsdeutsche Oberkapo and one SS-man were thrown into the burning furnace alive, another SS –man was beaten to death. After hastily grabbing some weapons they cut the barbed-wire fence, but instead of turning north-east in the direction of the Vistula River, they turn south-west in the direction of the sub-camp at Rajsko. er resistance. But they do manage to pour the explosives down the latrine, before the SS discover it. In Rajsko the SS block the escape routes of the Sonderkommando members, and the escapees seek refuge in a barn and prepare to defend themselves. The SS set fire to the barn and the prisoners are shot to death as they flee the burning barn. Jozef Warszawski - whose real name was Josef Dorebus, who had arrived in Auschwitz – Birkenau from Drancy. A fire-fighting squad was sent from Auschwitz main camp to put out the fire in Crematorium IV and witness the shooting to death of the members of Squad 59B. The fire-fighting squad is then sent to Rajsko to put out the burning barn, an air-raid prevented the SS men from pursuing the other escapees. In the evening, all the prisoners who were killed were brought to the grounds of Crematorium IV and the remaining members of the Sonderkommando are also brought to Crematorium IV. Another two hundred prisoners from the Sonderkommando who took part in the revolt are shot and killed. 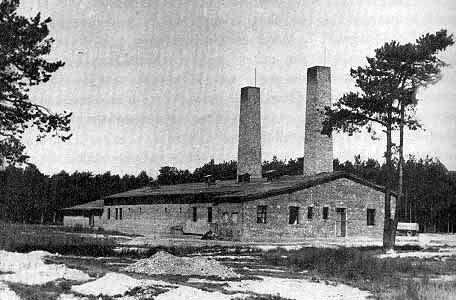 Following a short speech by the SS full of threats, the ghastly work resumed as normal in Crematoriums II, IIII and V.
Also in the evening when the all clear had sounded, SS patrols with dogs set off in search of the 12 members of the Sonderkommando at Crematorium II who were still missing. These twelve men had managed to cross the Vistula River, but exhausted they had hidden in an empty building. 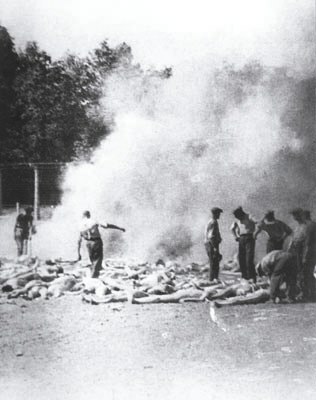 The SS tracked them down, killed them and brought their bodies back to the camp. On the 10 October 1944 three female Jewish prisoners employed in the Weichsel-Union – Metallwerke, Ella Gartner, Ester Wajsblum and Ragina Safin are arrested in the women’s camp of Auschwitz 1. They are charged with stealing explosives from the depot of the plant and giving them to the prisoners of the Sonderkommando. The prisoners fashioned primitive grenades which they used during the uprising. On the same day fourteen prisoners of the Sonderkommando were arrested and locked in the bunker of Block 11 in the Auschwitz main camp. Among those incarcerated Jankiel Handelsman from Radom, one of the organisers of the uprising, who was sent to Auschwitz – Birkenau on the 4 March 1943 in an RSHA transport from Drancy. Another prisoner was the Polish Jew Wrobel who received the explosives from the female munitions workers and five Russian Prisoners of War who had arrived from Majdanek on the 16 April 1944. The interrogation by the SS Political Department, by such members Draser and Broch, is conducted with great harshness. Two more female prisoners are arrested in the women’s camp of Auschwitz II on the charge of having contact with the Sonderkommando and transporting explosives there. 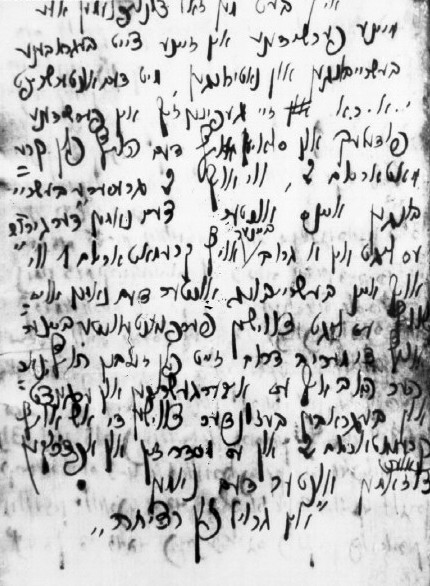 One of those arrested, the female Polish Jew Roza Robota worked in the personal effects camp, which bordered on the compound of Crematorium IV. Roza Robota accepted from one of her fellow prisoners explosive materials stolen by Ella Gartner, in the Weichsel –Union Metallwerke plant and passing it on to Wrobel, who was a member of the Sonderkommando. On the 6 January 1945 in the evening four female prisoners Ella Gartner, Roza Robota, Regina Safir and Ester Wajsblum are hanged in the women’s camp of Auschwitz. The execution takes place in two stages, two female prisoners are hanged during the evening roll call, in the presence of the male and female prisoners who work the night shift at the Weichsel –Union munitions plant. The other two female prisoners are hanged after the return of the squad that works the day shift. SS- Obersturmfuhrer Hossler reads out the sentence, and screamed that all traitors will be destroyed in this manner.